See Michele at Wellington's Restaurant at Waipuna Hotel and Conference Centre from 6.30pm to 7.30pm every Sunday night making sculptured balloon animals, flowers and hats for families at the tables. Michele has performed extensively in the Auckland area over the past 17 years to audiences as a balloon twister. Sculpturing assignments have taken her to Australia, Fiji, Vanuatu and the USA. 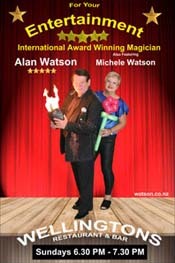 She is also a Life Member of the Society of American Magicians and a Honorary Member of the New Zealand Society of Magicians. Michele and husband Alan are recipients of the prestigious DRAGON Award. 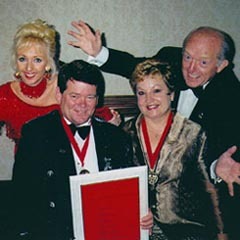 This was presented at the Centennial Celebrations of The Society of American Magicians on the 4th July, 2002, in New York before an audience of more than 1,400 magicians by Paul and Debbie Daniels. In 2018 Michele was present a Scroll of Honour by The Variety Club of New Zealand Inc. for contribution to the entertainment industry.